On Sunday I took one of those personality tests that are supposed to teach you how you learn or what your career should be or ...um...I don't really know what they are supposed to teach you. To no one's surprise I scored high on the kinesthetic, verbal and interpersonal scales. And to no one's surprise I scored very low on the visual scale. Me and art - we're not friends. My career choices will never include sculptor, artist, interior designer or anything that involves creating something pretty. I'm a failure even at the Paint Your Own pottery places. Abstract art at its finest? This is, in fact, not an abstraction because it is devoid of the spiritual connotations historically associated with abstraction. This piece indeed performs a general liquidation not only of abstraction, but also of everything that goes into it (earnestness, sincerity, lifestyle, palette, the gesture, all-over composition, even paint itself). As the artist, I literally and symbolically emptied the abstract gesture of its affirmative value and its power to suggest that which cannot be signified (ie, the transcendental). Ok...I stole all that malarky from an art review website. I don't know what it means and I don't think it applies. But you cannot deny that this is spray paint perfection! It's amazing how the paint almost hides the crashed in door. 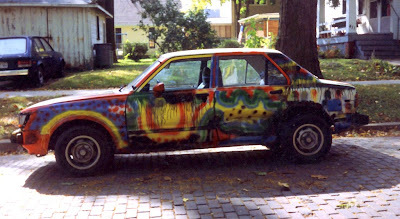 This is an almost absolutely perfect work of art, marred only by my sister's Grateful Dead sticker on the back windshield. 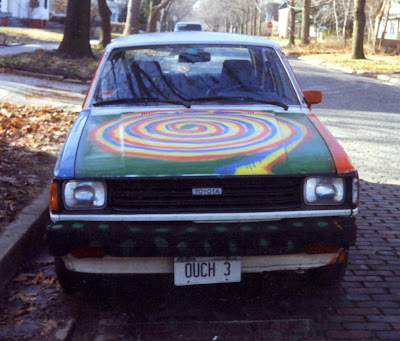 The Ouchmobile may be dead and gone, but it still lives in my heart. 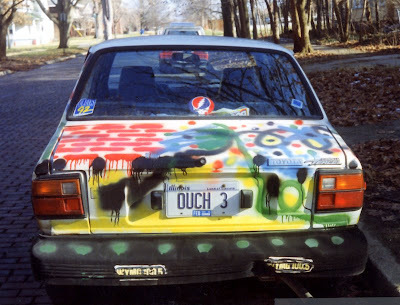 Maybe my 3-legged Mo is the reincarnation of my 3-doored car?